I finally found a pen I love and will not loose… well almost never loose. 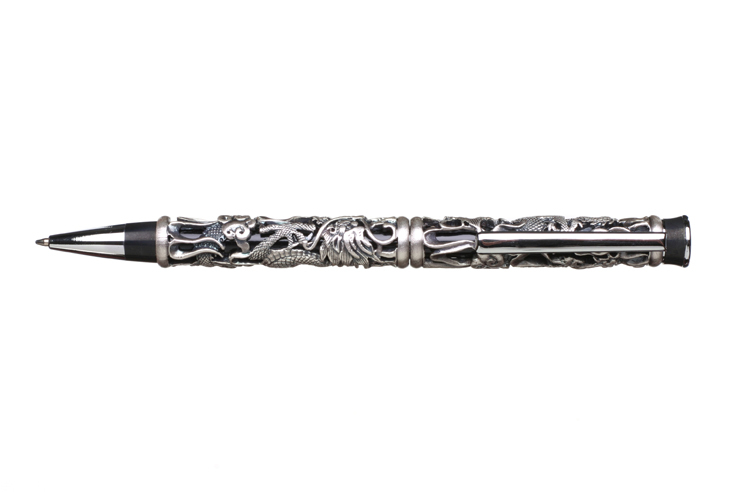 I was given a peweter dragon pen from French Quarter Pens a couple years ago and for the longest time I never lost it, misplaced it yes, but always found it. One day, on my way to the bus my purse went upside down in the car and partially out into the snow! I thought I’d lost my beloved pen forever and couldn’t find it anywhere. So for Christmas I was given a replacement. A couple weeks later I was looking in the car for something else and found my original pen! I was delighted as I now have 2 of these beautiful pens! They are heavy enough that they glide over the paper but don’t make your hand hurt like most heavier pens. Having it in my purse adds a little weight and so I know it’s always there! They are a delight to write with and frequently I bring out my pen specifically for meetings at work which causes discussions n good writing tools. I ride the Valley Mover, a local bus system in Alaska and whenever someone needs a pen I’m quick to bring out my beautiful pen for loan. More than a few times the hour drive is spent talking about how wonderful the pen is and how well it writes along with where it was purchased! We’ve also purchased several more pens and the accompanying letter openers and magnifying glass to give as gifts. No, I get nothing but the satisfaction that I have helped several people find a lovely pen and a small business in Louisiana, all the way from Alaska! Tagged Dragon Pen, French Quarter Pens, KEEP, More, pens, peweter, Valley Mover, writing tools.